I found this recipe when searching out ways to use up all the eggplants from the garden. Croquette is just a fancy word for patty. I actually made this recipe two different ways. 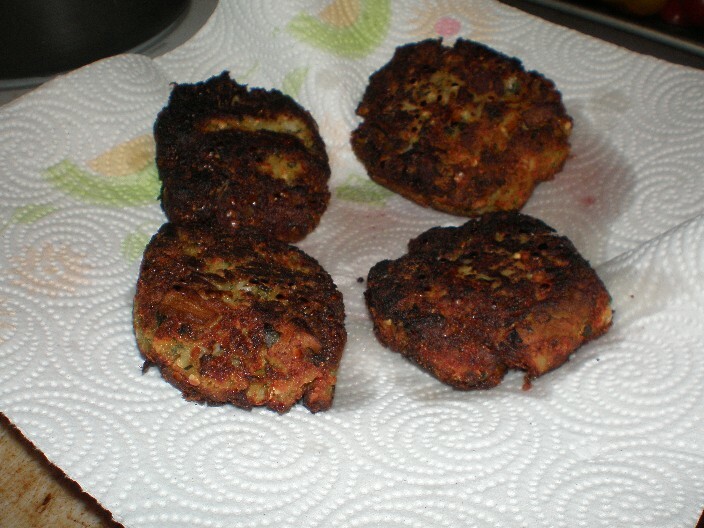 The first time I made it I fried the patties as the recipe says. Place eggplant in a microwave safe bowl and microwave on medium-high for 3 minutes. Turn eggplant over and microwave another 2 minutes. The eggplant should be tender. If not, cook another 2 minutes. Drain any liquids from the eggplants and mash. Add cheese, bread crumbs, egg, parsley, onion, garlic, salt and pepper to the eggplant and mix well. 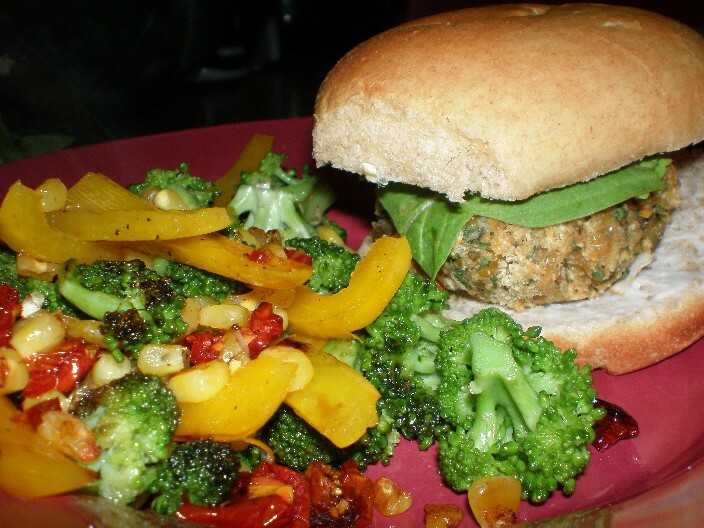 Shape the eggplant mixture into four patties. Heat oil in a large skillet. Drop eggplant one at a time into the skillet. Fry each side of the patties until golden brown, a few minutes on each side. Drain on paper towels. They got a little more brown that I had planned, but it didn’t matter. The fried version was sooooo delicious. The only thing I didn’t like was that my entire house smelled like fried food for two days. At first it smelled yummy but after a while it gets old. Several of the commenters on the recipe over at All Recipes said they had baked the croquettes instead of frying them to make them a little less bad for you. To bake them I mixed them the same way as before and formed them into patties. Then I baked them at 350 degrees F for 10 minutes, flipped and baked them for 10 more minutes. This time I ate them on a wheat bun with a little bit of light Miracle Whip and some arugula. I also cooked up some broccoli, yellow bell peppers (from the garden), corn (from my CSA), and sun dried tomatoes into a veggie mix to go with it. Very yummy! I will definitely be making these again. The original recipe says these can be frozen before frying (or baking) and cooked later. On the second time around I froze two of the unbaked patties so we’ll see how they turn out later. Previous Post I’m Choppin’ Broccoli….